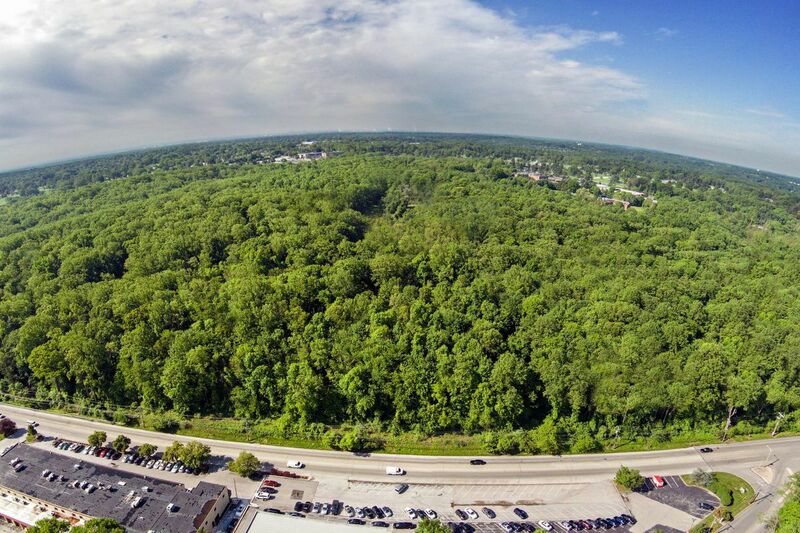 An aerial view of the 213 acres currently owned by the Archdiocese of Philadelphia. Peter Miller, president of Carlino Commercial Development, working under the development name Sproul Road Developers LLC, plans to redevelop 47.1 acres as commercial space, 5.1 acres as recreation fields, leaving more than 160 acres as open, forested land. Peter Miller, president of Carlino Commercial Development, made his intentions very clear to about 100 Marple Township residents at a meeting Monday night: One way or another, he and his partners would develop at least part of a 213-acre tract beloved for its green space. "Our preferred plan is to preserve … 166 acres and redevelop" 47 acres, Miller said during a question-and-answer session about the future of the Marple land, which is currently owned by the Archdiocese of Philadelphia. "But if we don't get the zoning support, I want you to really understand this, we are going to do" a larger project allowed under the current zoning. Raising the microphone to his lips, a resident pressed Miller. "So no matter what," the resident asked, "you're going to develop the property?" "We're going to develop the property," Miller confirmed. To many of the residents gathered inside the Cardinal O'Hara High School auditorium, Miller's announcement came as a surprise. Marple residents — joined by others from the region — had derailed a previous developer's efforts to build on the property, citing the need to protect open space in fast-growing Delaware County. Some who attended Miller's meeting came with similar opposition in mind. Residents from the Delaware County area hike on the land’s trails and collect trash. Residents have used the trails for years, even as the land was owned by the Archdiocese of Philadelphia. But during a 2½-hour informational session, the developers made clear that these circumstances were different. Unlike Bruce Goodman, the Jenkintown developer whose plans for the site crumbled in 2016 when he could not get the township approval he needed, Miller intends to settle his agreement of sale with the Archdiocese of Philadelphia. Shovels will be in the ground. And although Sproul Road Developers LLC — Miller's development group, formed in partnership with colleagues at Carlino, as well as Brian McElwee, president of Valley Forge Investment Corp. — plans to protect open space at the site, the group would change course if it does not get the approval it needs, Miller said. "We could have taken the easy way out and just done the by-right plan," Miller told the crowd, referring to a denser plan with dozens of homes and institutional space, which the zoning allows. "We're trying to do right." "Our sincere plan," Miller said in an interview afterward, "is to preserve … open space." That differs from Goodman's plan just a few years ago. Goodman, who had the land under sale agreement in 2014 for $47 million, including a $5 million nonrefundable deposit, had planned to build 318 homes, plus nearly one million square feet of commercial space, leaving only spotty open land. His plans were quashed when the township denied his zoning requests amid significant resident pushback. According to Miller, he is working with Delaware County on a plan that would have the county buy and preserve the forested land. John McBlain, Delaware County Council chairman, said Tuesday that although no formal agreement has been signed, the county has spoken with Miller about "potential frameworks" for a deal. Among the proposals Miller described Monday: Using some of the property taxes from the site's commercial development to underwrite a bond the county would use to buy the land. The most recent plan from Sproul Road Developers LLC for 213 acres in Marple Township, which was distributed at a meeting this month. The group plans to redevelop 47.1 acres as commercial space and 5.1 acres as recreation fields, leaving the remaining 161 acres as open, forested land. The plan to preserve 161 acres was hatched last year after Miller met with Save Marple Greenspace, a grassroots group that vehemently opposed Goodman. At the time, the organization told Miller it would support redevelopment of the Don Guanella Village portion of the site, a 38-acre defunct facility at 1797 Sproul Rd. In exchange for supporting that, the group told Miller, the rest of the land must be preserved as open space, according to Ken Hemphill, communications coordinator for the group. Since those meetings last year — and since Miller and the archdiocese agreed on an undisclosed purchase price — Miller's development has grown slightly. Meanwhile, Save Marple Greenspace's support has dissipated. "We agreed not to oppose the 38-acre [plan], but even that is too big now," Hemphill said this week. "We have reconsidered that … and rethought our position about traffic." "During our first meeting with Mr. Miller, he said he didn't want to fight the community," Hemphill continued. "I would hardly say coming out with a plan for 47 acres is not fighting the community." The reversal by Save Marple Greenspace could present a problem for Sproul Road Developers, whose preferred plan hinges on zoning approval from the township. The site is zoned as industrial along Sproul Road, and behind that, residential. To build their nearly 380,000-square-foot complex — which could include a Wegmans, a health-care facility, and senior housing, among other businesses — the developers need commercial approval. It's also possible that Save Marple Greenspace's resistance could be detrimental to their cause. If zoning is denied, Sproul Road Developers plans to proceed with a "by-right" plan to build a nearly 500,000-square-foot institutional project, such as a hospital. In addition, the developer said he would prepare the land so that nearly 209 homes could be built — eliminating most of the open space that Miller plans to save. A snapshot of a camp site inside the 213 acres in Marple Township. Beyond offering residents hiking trails, the site has been used as a location for other activities — some of them illegal. "If you shrink the development at the front too much, you have less money [from property taxes] … to help the county buy" the open space, Miller said. Sproul Road Developers is expected to formally present its plans May 21 at a township meeting. Until then, while some residents are gearing up to fight, others at Monday's night meeting issued an important warning. "I'm concerned that we would lose probably the last open space in the community if this is turned into a by-right [plan]," one woman told the crowd. "We don't have choices for open space … this is really the last frontier for us."